What Rachel and Stephanie have to say about school supplies may shock you–they both firmly believe in a “less is more” approach. Students do not need 50 pencils hidden in different parts of their backpack or 20 erasers scattered about. 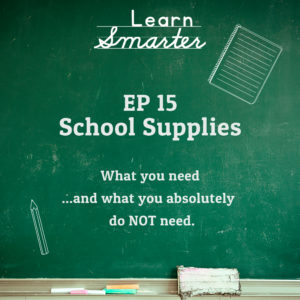 In this episode, Rachel & Steph get extremely specific about what school supplies are needed–and how little students actually need to be successful. Don’t forget to go to www.learnsmarter.com to join our mail list to connect! Sign up below to get our list of school supplies. Where is the school supply shopping list linked to amazon? I can’t find it!! Please send or help.